Martyn Walley, National Technical Manager at Aico, explains the potential impact of the latest development in smoke alarm technology – data extraction. Access to this information can tell you on site if there is an issue with the alarm that needs to be dealt with. However, what’s key here is that the data is generated in real time and that it is quick and easy to extract, otherwise its value is compromised. It’s important for both safety and cost implications that issues are identified on site and dealt with there and then. If you have to remove the alarm from its location to analyse the data, possibly sending to the manufacturer for analysis, it can become a cumbersome, expensive and long exercise. We have technology, for example, which enables data to be extracted in situ whilst on site via the alarm’s sounder using an AudioLINK enabled alarm, a tablet or smartphone and the free AudioLINK App. Being able to read and interpret the data is the next key challenge. Thankfully, alarm manufacturers are rising to the challenge and providing the data in easy to understand formats, such as colour coded reports that identify the urgency of any issue and, in some cases, what action to take next. In order for this to be effectively managed the data from each alarm needs to be simple to review and store and supplied in a flexible format to allow additional information to be accommodated, such as a site reference number, address or location. Of course, it also needs to be readily transferrable from the device you use to a central key location for future reference. It is also important that the data is stored for the life of the alarm enabling historic information to be retained and that it can be extracted again and again. Going a step further, what if you could extract whole system information for each property? 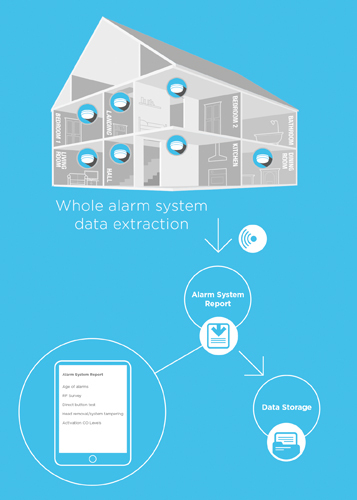 Whole system data extraction provides you with, for example, information on the number of devices on each system and their serial numbers, types of alarms, location of alarms, how long the alarm has been in operation and even RF signal strength between alarms if used. For larger systems (often in HMOs), this enables a history of alarm systems in individual dwellings to be created. We have already launched our first foray into whole system data extraction with RadioLINK+. When an alarm system is installed and set up, information on the system can then be accessed remotely and securely from within, or even from outside a property if access is an issue. It’s early days for data extraction technology in smoke alarms, but the positive impact this new technology could have for you and your customers is significant. But only if the data is generated in real time and is both quick and easy to access and store; being able to action something whilst on site makes a considerable difference to the outcome and to the budget.